Achy back? Give yoga a go! Numerous studies have shown the power of the ancient practice, which emphasizes stretching, strength, and flexibility, to relieve back soreness and improve function. Check out the article, below, for more information! According to research published in July 2017 in the Annals of Internal Medicine, yoga may even help reduce the need for pain medication. At the start of the three-month study, in which one group was assigned to physical therapy for their back pain, a second to yoga, and a third to reading about pain management strategies, 70 percent of the subjects were taking medication. By the end, however, while the number of people taking medication in the reading group stayed the same, only 50 percent of the yoga and physical therapy subjects were still taking it. It’s always a good idea to ask your doctor before starting a new fitness regimen, especially if you’re prone to pain. Once you get the green light, try these seven soothing poses for back pain. You can do these poses in any order. Gradually increase the intensity by holding them for longer amounts of time. 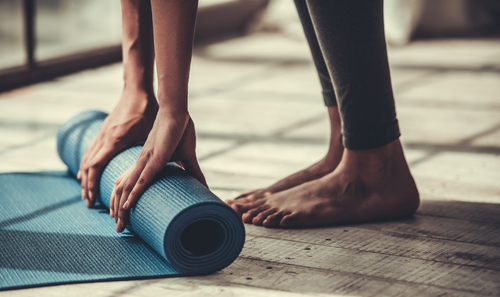 And you might even reap the other health perks of yoga, which include lowered heart rate, lowered blood pressure, improved sleep, and reduced symptoms of depression and anxiety. This classic yoga pose is a great total body stretch that targets back extensors: the large muscles that help form your lower back, support your spine, and help you stand and lift objects. Pigeon pose, which can be a little challenging for yoga newbies, stretches hip rotators and flexors. It may not seem like the most obvious position to treat a backache, but tight hips can contribute to lower back pain.